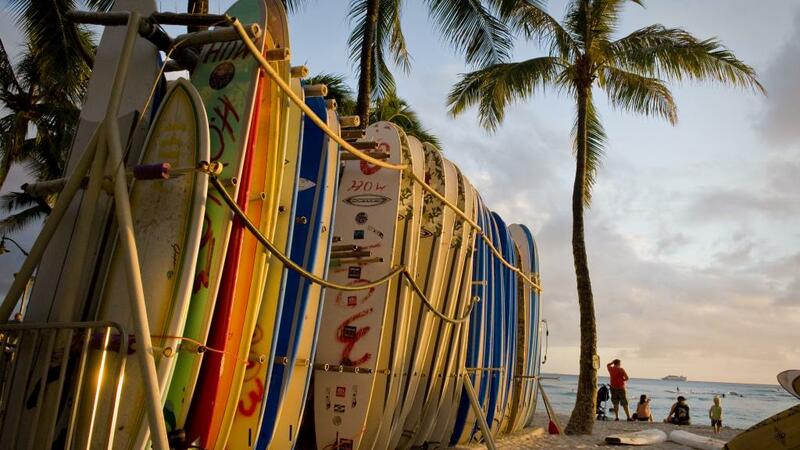 Surfing is an ancient and well-loved past time in Polynesia and the Hawaiian Islands. First documented in Hawaii in 1779, surfing or 'hee nalu' as the Hawaiians call it, is a sport that at one time was reserved only for alii (Hawaiian royalty). It is a widely held belief that this is the reason that surfing is known as the 'sport of kings'. In 1819, the kapu (the Hawaiian taboo system) came to an end, and today all people are free to enjoy the spectacular Hawaiian surf. From the early 1900s, surfing gained momentum, particularly on Waikiki Beach where Duke Kahanamoku (also known as 'The Big Kahuna') grew up and began surfing the South Shore. Growing up to become a multiple Olympic gold-medal winner and surf teacher, Duke has a reputation for being the 'father of surfing'. Credited for spreading the Hawaiian surfing popularity across mainland USA and even as far as Australia, today there is a bronze statue of Duke that stands in Waikiki, welcoming visitors, pro-surfers and first timers alike. Hawaii is also considered the birthplace of big wave surfing when 1950s surfers started to ride the powerful winter waves in West Makaha and Waimea Bay on Oahu's North Shore. From November to February each year, big wave season hits the Hawaii surf on the North Shore and a number of surfing competitions bring the crowds for the season. One of the world's best surfing competitions, the Vans Triple Crown of Surfing, is held in November or December on the North Shore each year. Truly a unique experience to see the pros rip it up, be sure to arrive early as the traffic can be crippling. Hawaii is also a great place for first timers as learn-to-surf lessons are available every day on each island. Often about 1-2 hours long, experienced surfers will guide you through the waters in gentle conditions.